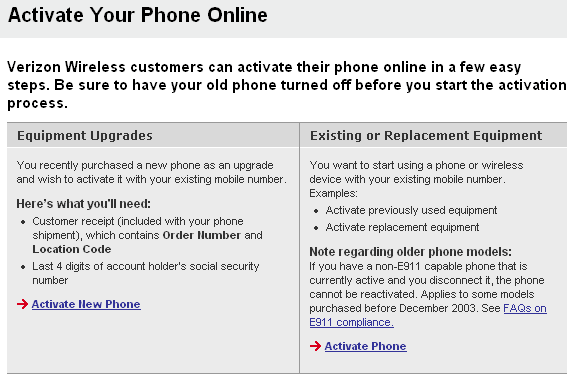 Replacing your Verizon phone, but don't want to deal with customer service or pay their $20 fee? Learn how to do it yourself, at no charge. 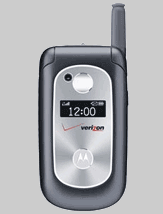 Recently due to an unfortunate incident entirely my fault, my Verizon cell phone was damaged beyond repair. 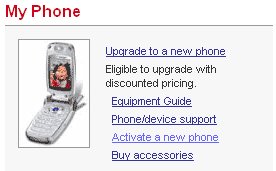 I purchased an old phone off eBay and called Verizon customer service to find out how to activate it as a replacement. They told me they could do it for me, for $20! Not willing to be ripped off, I did some searching and eventually found the (conveniently unpublicized) Verizon web interface that lets you do it easily, for free. If you're looking to replace a Verizon cell phone, with either a new upgrade or a previously used phone, this guide will show you how. First, you need to log into your Verizon Wireless account. Scroll to the bottom of your account page to the section called My Phone. Click the link there that reads Activate a new phone. The next step is to select whether your phone is new, or previously used. Since I activated a previously used phone, this article will assume the latter path. Selecting your phone as new is not much different- it mainly requires you to provide information from the phone's purchase receipt and the last 4 digits of the account holder's social security number. On the next screen you will be asked to select the phone number this new phone will be registered to. 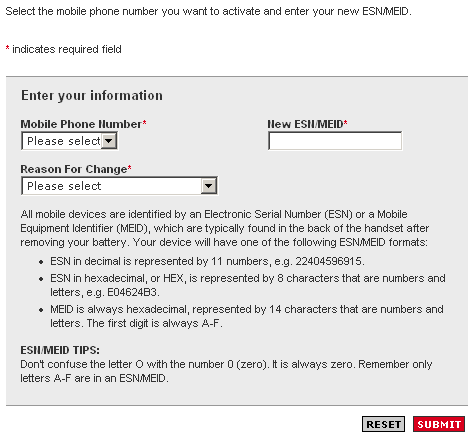 You will need the Electronic Serial Number (ESN) or Mobile Equipment Identifier (MEID), which is usually found printed on your phone beneath the battery. ESN is represented either as 11 numbers, or 8 hexidecimal (0-9, A-F) characters. MEID is 14 hexidecimal characters. Finally, you are asked for the reason you are changing phones. What you choose here doesn't make a difference, so you can pick 'Other' if you are not sure. If all goes well, you should receive a confirmation page. Wait a few minutes, then dial *228 from your Verizon phone to program it with the new settings. You are now ready to use your new phone!